The Miami Heat‘s mission to trade for Minnesota Timberwolves small forward Jimmy Butler is only intensifying. While everyone in Miami would obviously love to have the All-Star, there is one key Heat member who desperately wants to see Butler come to South Florida. Butler, 29, has a requested a trade from Minnesota, where he has only played only one season. The 6-foot-8 small forward had a wonderful campaign with the Timberwolves last year, averaging 22.2 points, 5.3 rebounds and 4.9 assists. It’s not often a borderline superstar becomes available in trade talks, especially when the obtainable player wants to play for your team. In the eyes Spoelstra, the ability to acquire a star with the talent level of Butler immediately raises the team’s chances to win. 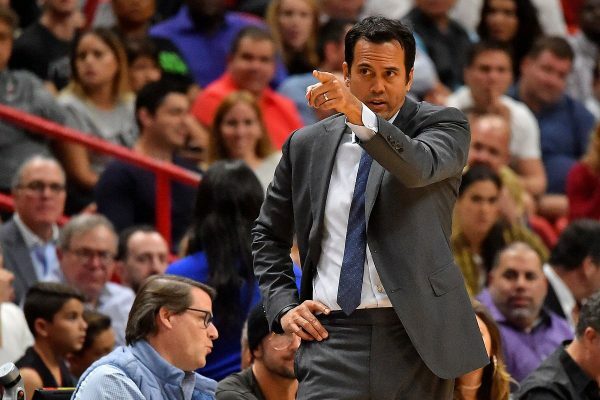 Although Butler’s behavioral issues have been a point of concern, Spoelstra is indeed the type of coach who can handle it. The 47-year-old head coach has handled plenty of drama and big egos after spending four years winning championships with LeBron James, Dwyane Wade and Chris Bosh. Furthermore, Spoelstra’s hard-nosed, gritty, intense style fits perfectly with the seven-year pro. Butler, who has earned a strong reputation on both sides of the floor, is a four-time All-Defensive Team member. There’s no doubt the league should be very afraid if Butler pairs up with Spoelstra because the two seem to have numerous basketball ideologies and playing styles in common.